MASERATI'S new more compact Ghibli sedan will start from $138,900 when it arrives in the coming months. That pricing is more than $100,000 below the previous entry point for the larger Quattroporte. The range-topping Ghibli S will be priced from $169,900. Scheduled to arrive "mid-year", it will take the fight to the BMW 5 Series, the Mercedes E-Class, Mercedes CLS and the Audi A6/A7. The most affordable Maserati with a V6 petrol engine has 243kW of power and 500 Nm of torque, and has fuel consumption of 9.6 litres/100km. The new Maserati Ghibli is also the first Maserati to offer diesel power, with a 3.0-litre turbo diesel delivering 202 kW and a crushing 600 Nm torque that ensures it can provide the exhilarating performance expected of a Maserati, with a zero to 100kmh time of 6.3 seconds matched to an average fuel consumption fuel figure of 5.9 litres per 100km. The Ghibli's most powerful model, the Ghibli S, has 301kW of power, races to 100 kmh in 5.0 seconds and stretches out to a top speed of 285kmh. "With the choice of twin turbo petrol and turbo diesel engines, the Ghibli offers two driving experiences, different yet equally exhilarating and, therefore, what is expected of a Maserati," said Maserati's Glen Sealey. "The petrol engines provide the traditional sports car performance of an advanced petrol engine across a wide rev-range, while the turbo diesel provides the effortless, unstoppable thrust of acceleration delivered by a wall of torque at low engine speeds. It is this driving experience that will lead a portion of customers to select the turbo diesel variant, with the added benefit of the range it offers between fill-ups - up to 1100km on open roads." Compared with the larger Quattroporte, the Ghibli is 50kg lighter, 173mm shorter in the wheel base and 291mm shorter overall. The Quattroporte has donated much of its under the skin technology, including core architecture, including its crash safety, chassis, suspension architecture, engines and LED headlight technology, ensuring the new model has the highest levels of safety, NVH and technology from which to develop its own distinct and different character. Features will include Maserati Touch Control screen, reversing camera, Poltrona Frau leather interior and the 15-speaker Bowers & Wilkins audio system, as well as WLAN-based WiFi and compatibility with most modern mobile phone systems. 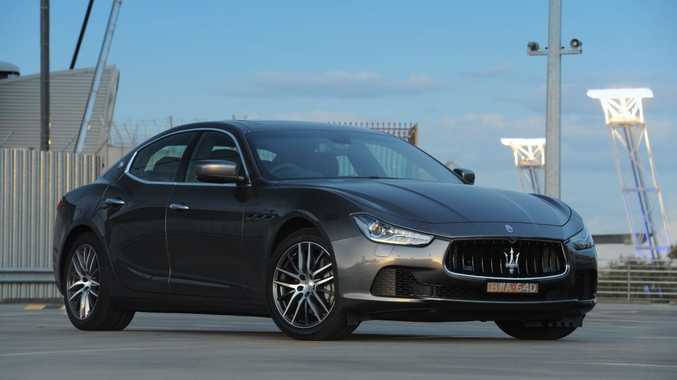 The Ghibli has been designed and engineered by Maserati and is the second model (after the Quattroporte) to be manufactured in Maserati's refurbished facility in Grugliasco (near Turin).